In my last post, I have explained very basic information for Machine learning and I also explained the development life cycle for a Machine learning project. In this post, I will explain some frequent issues during the Machine Learning development and how you can overcome using Azure Machine Learning along with some basic Data cleansing task using Azure Machine Learning. In the Machine learning workflow, there is, sometimes, friction in the hand over between Data scientist and Operations. Thus Data scientist loses visibility in the model performance due to that. How Azure Machine learning can solve this big problem? What are the components of Azure Machine learning? It is an Azure service which consists of libraries like Microsoft ML Spark libraries and tools like Azure Workbench and these work together with the IDEs like Visual Studio Code, PyCharm, Jupyter etc and third-party libraries like TensorFlow, TLC, CNTK etc. You can train as well as deploy using Docker on Azure Compute such as HD Insight, VMs, GPUs, Azure container services as well as IOT devices. Can it help developers as well? How to get into Azure Machine Learning? To get started with Studio, go to https://studio.azureml.net. 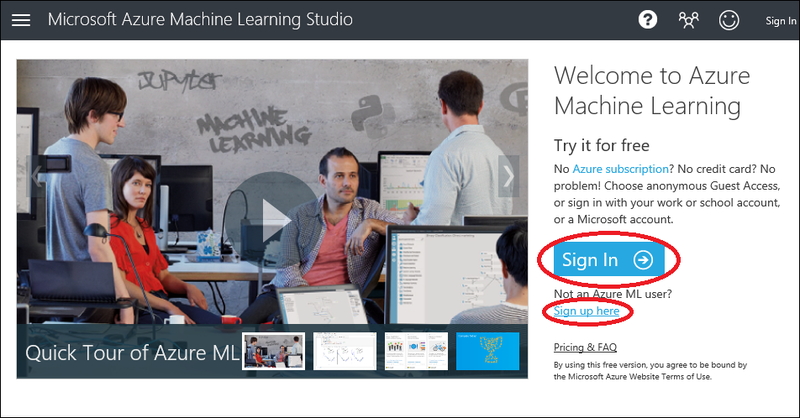 If you’ve signed into Machine Learning Studio before, click Sign In. Otherwise, click Sign up here and choose between free and paid options. Now let us take a quick example of Data cleansing of some large data in Azure Machine learning. For example, our task is to find whether the image has snow leopard or not. There are a bunch of images and from these images, we are required to find which are those images which have snow leopard in it. As you can see in above image, all those images have some unique image number. So our first task is to take out those unique numbers from those long path. With Azure Machine Learning, it can be done by just a few clicks. We will use Derive column by Example feature for this. As you can see, it learned to take out the image number from rest of the images even though some of the images have parenthesis. Now let us see another example of cleansing the data task. By very few clicks, we can do data cleaning tasks. Microsoft research has many pre-existing libraries but we can use other open source and third party libraries. In next post, we will see how we can integrate Python code into Azure Machine Learning to improve the accuracy and the deployment of the same Snow Leopard model. These fxuo2.ga http://fxuo2.ga/ are wonderful. They appear awesome with everthing. Sturdy, fashion, nice.I am extremely proud of them.